After President Brigham Young died, the Quorum of the Twelve Apostles, presided over by John Taylor, led the Latter-day Saints for three years. On 10 October 1880, John Taylor was sustained as President of the Church. President Taylor was a gifted writer and journalist who published a book on the Atonement and edited some of the Church’s most important periodicals, including the Times and Seasons and the Mormon. On many occasions he displayed his courage and his deep devotion to the restored gospel, including voluntarily joining his brethren in Carthage Jail, where he was shot four times. His personal motto, “The kingdom of God or nothing,” signified his loyalty to God and the Church. President Taylor was committed to doing all he could to see that the gospel was proclaimed to the ends of the earth. In the October 1879 general conference, he called Moses Thatcher, the Church’s newest Apostle, to begin proselyting in Mexico City, Mexico. Elder Thatcher and two other missionaries organized the first branch of the Church in Mexico City on 13 November 1879, with Dr. Plotino C. Rhodacanaty as the branch president. Dr. Rhodacanaty had been converted after reading a Spanish Book of Mormon pamphlet and writing to President Taylor for additional information about the Church. With a nucleus of twelve members and three missionaries, the restored gospel began to spread slowly among the Mexican people. On 6 April 1881, Elder Thatcher, Feramorz Young, and a Brother Páez hiked to a height of 15,500 feet on Mount Popacatepetl and held a brief dedication service. Kneeling before the Lord, Elder Thatcher dedicated the land of Mexico and its people that they might hear the voice of the Lord, their true shepherd. Elder Thatcher returned to Salt Lake City and recommended that additional missionaries be called to serve in Mexico. Soon several young men, including Anthony W. Ivins, a future member of the First Presidency, were laboring in Mexico City. As part of the Church’s effort in the Mexican Mission, a Spanish language edition of the Book of Mormon was published in 1886. The story of Milton Trejo, who helped to translate the Book of Mormon and other Church literature into Spanish, demonstrates how the Lord directs his work. Milton Trejo was born in Spain and grew up without settling on any religion. He was serving in the military in the Philippines when he heard a remark about the Mormons in the Rocky Mountains and felt a strong desire to visit them. Later he became very ill and was told in a dream that he must visit Utah. When he recovered, he journeyed to Salt Lake City. He met Brigham Young and investigated the gospel. He became convinced that he had found the truth and became a member of the Church. He served a mission in Mexico and was then prepared, spiritually and intellectually, to play a major role in seeing that Spanish-speaking people could read the Book of Mormon in their own language. President Taylor also called missionaries to carry the gospel to the Indians living in the American West. Amos Wright’s labors were particularly fruitful among the Shoshone tribe residing on Wyoming’s Wind River Reservation. After having served for only a few months, Wright had baptized more than 300 Indians, including Chief Washakie. Latter-day Saint missionaries also carried the gospel to the Navajos, the Pueblos, and the Zunis living in Arizona and New Mexico. Wilford Woodruff spent a year proselyting among the Indians, including the Hopis, Apaches, and Zunis. Ammon M. Tenney assisted in baptizing more than 100 Zuni Indians. The gospel was also preached in Polynesia. Two Hawaiians, Elders Kimo Pelio and Samuela Manoa, were sent to Samoa in 1862. They baptized about 50 people, and Elder Manoa continued to live in Samoa with his converts for the next 25 years. In 1887 Joseph H. Dean of Salt Lake City, Utah, received a call to serve a mission in Samoa. Elder Manoa and his faithful wife opened their home to Elder Dean and his wife, Florence, the first Latter-day Saints from outside Samoa they had seen in more than two decades. Elder Dean soon baptized 14 people into the Church and about a month later delivered his first sermon in the Samoan language.2 Thus missionary work began anew on the island. On 6 April 1880, Church members celebrated the fiftieth anniversary of the organization of the Church. They called it a Jubilee Year, as the ancient Israelites had named every fiftieth year. President Taylor forgave many of the debts owed to the Church by its needy members. The Church also contributed 300 cows and 2,000 sheep to be distributed among its “deserving poor.”4 The Church’s Relief Society sisters donated almost 35,000 bushels of wheat to those in need. President Taylor also urged Church members to forgive individual debt, especially among the distressed. “It is the time of Jubilee!” he declared.5 A spirit of forgiveness and joy was strongly felt among the Latter-day Saints. The last day of the April 1880 Jubilee general conference was very moving. Eleven of the Twelve Apostles bore their testimonies in the concluding session. Orson Pratt, one of the original members of the Quorum of the Twelve Apostles, spoke about the time when the entire Church had met in the Peter Whitmer Sr. home in Fayette, New York. He recalled the trials, the gatherings, the persecutions, and the afflictions of the Latter-day Saints and felt thankful that he was still “numbered with this people.” Then he bore testimony “concerning the great work which the Lord our God has been doing during the last fifty years.”6 Elder Pratt had only a few months left to live and felt joyful that he had endured to the end as a faithful Latter-day Saint. Two years before the Jubilee celebration, President John Taylor had authorized the establishment of an organization to provide religious instruction to children. The first Primary was begun in Farmington, Utah, about 15 miles north of Salt Lake City, and by the mid-1880s, a Primary had been organized in almost all Latter-day Saint settlements. The Primary has grown to include millions of children throughout the world, who are blessed by the gospel instruction, music, and associations they enjoy each week. While working on the translation of the Bible in the early 1830s, the Prophet Joseph Smith became troubled by the fact that Abraham, Jacob, David, and other Old Testament leaders had more than one wife. The Prophet prayed for understanding and learned that at certain times, for specific purposes, following divinely given laws, plural marriage was approved and directed by God. Joseph Smith also learned that with divine approval, some Latter-day Saints would soon be chosen by priesthood authority to marry more than one wife. A number of Latter-day Saints practiced plural marriage in Nauvoo, but a public announcement of this doctrine and practice was not made until the August 1852 general conference in Salt Lake City. At that conference, Elder Orson Pratt, as directed by President Brigham Young, announced that the practice of a man having more than one wife was part of the Lord’s restitution of all things (see Acts 3:19–21). Many of America’s religious and political leaders became very angry when they learned that Latter-day Saints living in Utah were encouraging a marriage system that they considered immoral and unchristian. A great political crusade was launched against the Church and its members. The United States Congress passed legislation that curbed the freedom of the Latter-day Saints and hurt the Church economically. This legislation ultimately caused officers to arrest and imprison men who had more than one wife and to deny them the right to vote, the right to privacy in their homes, and the enjoyment of other civil liberties. Hundreds of faithful Latter-day Saint men and a few women served time in prisons located in Utah, Idaho, Arizona, Nebraska, Michigan, and South Dakota. Persecution also became intense for many who accepted callings to preach the gospel, especially in the southern United States. For example, in July 1878 Elder Joseph Standing was brutally murdered while laboring near Rome, Georgia. His companion, the future Apostle Rudger Clawson, only narrowly escaped death. 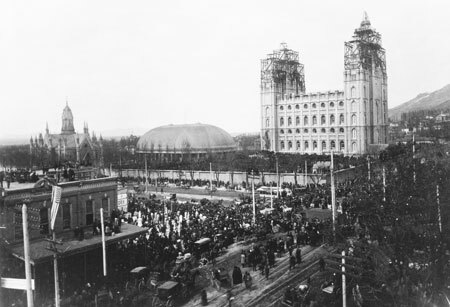 The Saints in Salt Lake City were very affected by the news of Elder Standing’s murder, and thousands of people attended his funeral in the Salt Lake Tabernacle. Elders John Gibbs, William Berry, William Jones, and Henry Thompson traveled throughout much of Tennessee attempting to change the public’s perception of the Church. They rested one Sabbath morning in August 1884 at the James Condor home near Cane Creek in Tennessee. As Elder Gibbs studied the scriptures looking for a text for his sermon, a mob burst through the forest and began shooting. Elders Gibbs and Berry were killed. Elder Gibbs, a schoolteacher, left a wife and three children mourning his death. Sister Gibbs remained a widow for 43 years and became a midwife to support her children. She died faithful in the gospel, anticipating a joyful reunion with her husband. Brigham Henry Roberts, the acting mission president at the time of the murders, risked his life by going in disguise to exhume the bodies of Gibbs and Berry. He returned the bodies to Utah, where many wards held memorial services in honor of the two elders. Missionaries in other areas were beaten until blood ran down their backs, and many carried the scars of these whippings to their graves. It was not an easy time to be a member of the Church. Many Church leaders went into hiding to avoid arrest by federal officers searching for men with more than one wife. Families feared late-night intrusions by these officers. President George Q. Cannon, Lorenzo Snow, Rudger Clawson, Brigham Henry Roberts, George Reynolds, and many others were sent to prison, where they passed the time by writing books, teaching school, and composing letters to their families. President John Taylor was forced to live in exile in Kaysville, Utah, about 20 miles north of Salt Lake City, where he died on 25 July 1887. He was a man of faith and courage who devoted his life to his testimony of Jesus Christ and to the establishment of God’s kingdom on the earth. Wilford Woodruff was one of the Church’s most successful missionaries and was also known for his prophetic insights and loyalty to the Church. He kept meticulous journals, which provide much information about the early history of the Church. He was serving as President of the Quorum of the Twelve Apostles when John Taylor died, and almost two years later he was sustained as the President of the Church. During his administration, the political crusade against the Latter-day Saints intensified, but the Church moved forward. Temples were operating in three Utah towns—St. George, Logan, and Manti—and the Salt Lake Temple was nearing completion. These houses of the Lord enabled thousands of Saints to obtain their endowments and do ordinance work for their kindred dead. President Woodruff had a lifelong interest in temple and family history work. He admonished the Saints on many occasions to perform ordinances in the temple for their ancestors. The following incident emphasizes the importance of the work the Saints were performing for the dead. In May 1884, Bishop Henry Ballard of the Logan Second Ward was signing temple recommends at his home. Henry’s nine-year-old daughter, who was talking with friends on the sidewalk near her home, saw two elderly men approaching. They called to her, handed her a newspaper, and told her to take it to her father. The girl did as she was asked. Bishop Ballard saw that the paper, the Newbury Weekly News, published in England, contained the names of more than 60 of his and his father’s acquaintances, along with genealogical information. This newspaper, dated 15 May 1884, had been given to him only three days after it was printed. In a time long before air transportation, when mail took several weeks to get from England to western America, this was a miracle. The next day, Bishop Ballard took the newspaper to the temple and told the story of its arrival to Marriner W. Merrill, the temple president. President Merrill declared, “Brother Ballard, someone on the other side is anxious for their work to be done and they knew that you would do it if this paper got into your hands.”7 This newspaper is preserved in the Church Historical Library in Salt Lake City, Utah. In spite of persecution, Church leaders still encouraged the colonization of unsettled areas in America’s west. Beginning in 1885, many Latter-day Saint families settled in Sonora and Chihuahua, Mexico, establishing such towns as Colonia Juárez and Colonia Díaz. Other areas in northern Mexico also received immigrant Church members. Church members also looked north to Canada for a place to colonize. Charles O. Card, who served as president of the Cache Valley Stake, founded a Latter-day Saint community in southern Alberta in 1886. By the winter of 1888, more than 100 Latter-day Saints lived in western Canada, and more came during the 1890s, providing the labor to construct an irrigation system and a railroad. Many Church leaders matured in Alberta. As the 1880s drew to a close, the United States government passed additional laws that deprived those who practiced plural marriage of the right to vote and serve on juries and severely restricted the amount of property the Church could own. Latter-day Saint families suffered as even more fathers went into hiding. President Woodruff pleaded with the Lord for guidance. On the evening of 23 September 1890, the prophet, acting under inspiration, wrote the Manifesto, a document that ended plural marriage for Church members. The Lord showed President Woodruff in vision that unless the practice of plural marriage was ended, the United States government would take over the temples, thus ending work for the living and the dead. On 24 September 1890, the First Presidency and the Quorum of Twelve Apostles sustained the Manifesto. The Saints approved it in the October 1890 general conference. Today this document is included in the Doctrine and Covenants as Official Declaration 1. Following the Church’s action, federal officials issued pardons to Latter-day Saint men convicted of violating the antipolygamy laws and much of the persecution stopped. But, as President Woodruff explained: “I should have let all the temples go out of our hands; I should have gone to prison myself, and let every other man go there, had not the God of heaven commanded me to do what I did do; and when the hour came that I was commanded to do that, it was all clear to me. I went before the Lord, and I wrote what the Lord told me to write” (“Excerpts from Three Addresses by President Wilford Woodruff Regarding the Manifesto,” included after Official Declaration—1). God, not the United States Congress, brought about the official discontinuance of plural marriage. Long before the Latter-day Saints founded a genealogical society, Church members gathered records documenting the lives of their dead ancestors. Wilford Woodruff, Orson Pratt, and Heber J. Grant are among those who obtained the names of thousands of ancestors for whom they performed temple ordinances. In 1894, the First Presidency directed that a genealogical society be organized with Elder Franklin D. Richards as its first leader. A library was established, and representatives of the society went throughout the world in search of names of people for whom temple ordinances could be performed. This society led to the creation of the Family History Department of the Church. During the April 1894 general conference, President Woodruff announced that he had received a revelation about genealogical work. He declared that God wanted the Latter-day Saints “to trace their genealogies as far as they can, and to be sealed to their fathers and mothers. Have the children sealed to their parents and run this chain through as far as you can get it. … This is the will of the Lord to his people,” he said, “and I think when you come to reflect upon it you will find it to be true.”8 Latter-day Saints are still encouraged to seek out the records of their deceased ancestors and perform temple ordinances in their behalf. A year later on 2 September 1898, President Woodruff died while visiting in San Francisco. During President Snow’s administration, the Church faced serious financial difficulties that had been brought about by the federal government’s legislation against plural marriage. President Snow pondered and prayed for guidance about how to free the Church from its debilitating debt. Following the April 1899 general conference, he felt inspired to visit St. George, Utah. While speaking at a meeting there he paused for some time, and when he continued, he declared that he had received a revelation. The people of the Church had neglected the law of tithing, and the Lord had told him that if Church members more faithfully paid a full tithing, blessings would be showered upon them. The prophet preached the importance of tithing to congregations throughout Utah. The Saints obeyed his counsel, and that year they paid twice as much tithing as the previous year. By 1907, the Church possessed sufficient funds to pay all its creditors and become debt-free. In 1898, at a reception for the general board of the Young Ladies Mutual Improvement Association, President George Q. Cannon announced that the First Presidency had made a decision to call “some of our wise and prudent women into the missionary field.”15 Before this time, a few sisters had accompanied their husbands on missions, but this was the first time that the Church had officially called and set apart sisters as missionary ambassadors of the Lord Jesus Christ. While sisters do not have the duty to serve missions, in the past decades thousands have exercised this privilege and served the Lord valiantly as full-time missionaries. President Lorenzo Snow led the Church into the twentieth century. When the new century dawned, the Church had 43 stakes, 20 missions, and 967 wards and branches. There were 283,765 members, most of whom resided in the Rocky Mountain area of the United States. Four temples were in operation, and the Juvenile Instructor, Improvement Era, and Young Women’s Journal carried articles about the Church to its members. Rumors circulated that at least one new mission might be opened, and Latter-day Saints could scarcely imagine what the next hundred years would bring. Yet they were confident that prophecies concerning the destiny of the Church would be fulfilled. Kahlile Mehr, “Enduring Believers: Czechoslovakia and the LDS Church, 1884–1990,” Journal of Mormon History (Fall 1992), 112–13. R. Lanier Britsch, Unto the Islands of the Sea: A History of the Latter-day Saints in the Pacific (1986), 352–54. Lee G. Cantwell, “The Separating Sickness,” This People (Summer 1995), 58. B. H. Roberts, A Comprehensive History of the Church, 5:592. B. H. Roberts, A Comprehensive History of the Church, 5:593. B. H. Roberts, A Comprehensive History of the Church, 5:590–91. Melvin J. Ballard: Crusader for Righteousness (1966), 16–17. James R. Clark, comp., Messages of the First Presidency of The Church of Jesus Christ of Latter-day Saints, 6 vols. (1965–75), 3:256–57. James B. Allen, Jessie L. Embry, Kahlile B. Mehr, Hearts Turned to the Fathers: A History of the Genealogical Society of Utah, 1894–1994 (1995), 39–41. B. H. Roberts, A Comprehensive History of the Church, 6:236. “Wilford Woodruff Journals” (1833–98), 6 Apr. 1893; in LDS Church Archives; spelling and punctuation modernized. Richard Neitzel Holzapfel, Every Stone a Sermon (1992), 71, 75, 80. See Matthias F. Cowley, Wilford Woodruff (1909), 602. “The Redemption of Zion,” Millennial Star, 29 Nov. 1900, 754. “Biographical Sketches: Jennie Brimhall and Inez Knight,” Young Women’s Journal, June 1898, 245.